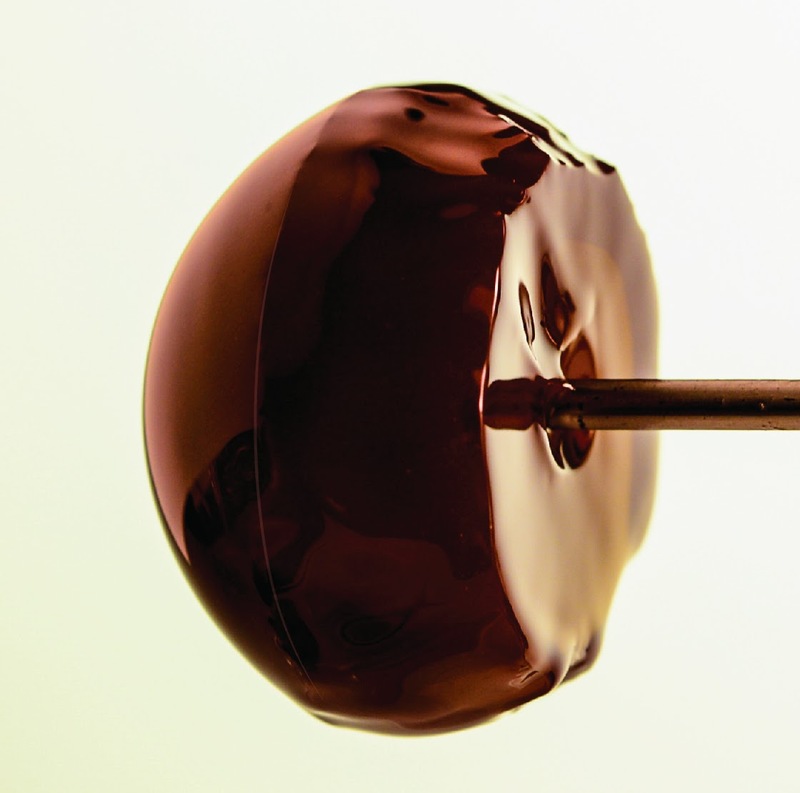 Physics Buzz: Physicists Ask: How Many Licks Does It Take to Get to the Center of a Lollipop? Jinzi Mac Huang, NYU graduate student in applied mathematics and lead author on the work, prepared homemade lollipops out of a simple solution of boiled sugar, corn syrup, and water, which he set into molds of various shapes. 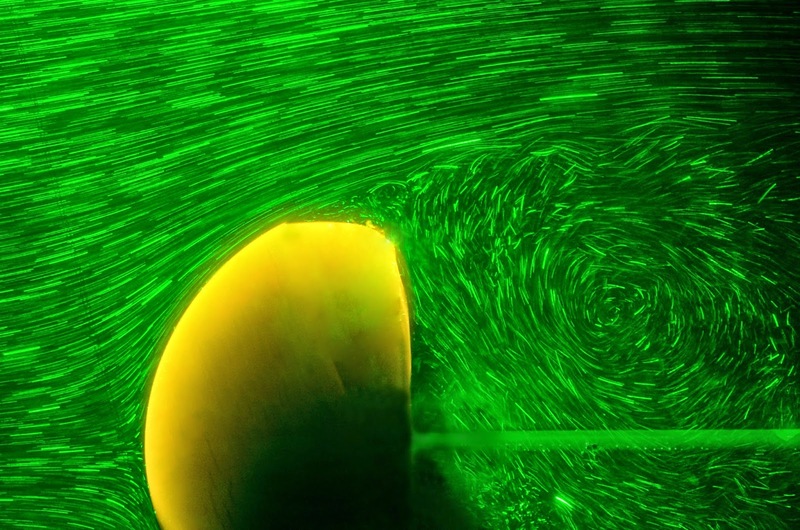 The researchers immersed the lollipops in a keyboard-sized "water tunnel" (analogous to a wind tunnel) with water speeds ranging from 0.2 to 2 miles per hour and watched them dissolve. The video above (courtesy of Leif Ristroph) shows the full time-lapse disappearance of the originally-spherical lollipop. Lollipop after 60 minutes dissolving in a 30 cm/s flow of water. The lollipop was originally spherical. The above image shows a partially-dissolved lollipop with a smooth rounded front, a beveled facet in the middle, and a flat back side, a shape which the researchers saw emerge again and again. "A peculiar shape emerges and then persists as the body vanishes, and this same final sculpture is unveiled regardless of the initial form and imposed flow speed," said Ristroph. The team also dissolved cylindrical lollipops and surprisingly found the same unique shape emerge as for the spherical lollipop. This indicates that there is a preferred shape for general objects dissolving in a flow, which has potential applications in both geology and in medicine, such as how pills dissolve in the human body. "Much more than a curiosity, understanding how materials dissolve is critical to the chemical and pharmaceutical industries," said Ristroph. "Geologically, our studies link the morphology of eroding and dissolving surfaces to the flows present, which could offer a way to infer past environmental conditions from the shapes of landforms." Along with the experimental data, the team theoretically modeled how the lollipop dissolves over time and how the rate depends on flow speed. For example, they predicted that if the flow speed was 4 mph instead of 1 mph, then the lollipop would completely dissolve in half the time. This prediction was exactly matched by the real data. "this scaling allows us to address the following long-standing question: 'How many licks does it take to get to the centre of a lollipop?' For candy of size a ~ 1 cm licked at a speed of U0 ~ 1 cm s-1, we estimate a total of U0/vn ~ 1000 licks, a prediction that is notoriously difficult to test experimentally."